Oronhyatekha (10 August 1841 – 3 March 1907), ("Burning Sky" or "Burning Cloud" in the Mohawk language, also carried the baptismal name Peter Martin), was a Mohawk physician, scholar, and a unique figure in the history of British colonialism. He was the first known aboriginal Oxford scholar; a successful CEO of a multinational financial institution; a native statesman; an athlete of international standing; and an outspoken champion of the rights of women, children, and minorities. Once thought to be the first Native M.D. in Canada, a recent book on Dr. Peter Edmund Jones, an Ojibwa from New Credit, has shown Jones to have graduated few months before Dr. Oronhyatekha. While all this would be remarkable in any age, that he achieved it during the Victorian era, when racism and assimilation were commonplace, has made him a figure approaching legend in some aboriginal circles. Born 10 August 1841 on the Six Nations of the Grand River near Brantford, Ontario, he was the sixth son of Peter Martin and Lydia Loft (from Tyendinaga), and one of up to eighteen children. He first attended the Mohawk Institute residential school and learned the shoemaker trade. He attended the Wilbraham Wesleyan Academy in Wilbraham, Massachusetts. After graduating, he taught for a year among the Indians and then entered Kenyon College for three years. Oronhyatekha was selected at the age of twenty by the Six Nations Iroquois Confederacy (consisting of the Mohawk, Oneida, Onondaga, Cayuga, Seneca, and Tuscarora Nations) to give the welcoming address to the Prince of Wales during his visit to the New World. Legend has it that Prince Edward was sufficiently impressed that he urged the young Oronhyatekha to attend the University of Oxford, where he himself had attended, but correspondence between Oronhyatekha and the Prince's physician Henry Acland suggests it was really Acland's idea. Acland taught at Oxford and became Oronhyatekha's mentor and friend for the rest of their lives. Oronhyatekha matriculated at St Edmund Hall, Oxford in May 1862 but returned home shortly afterwards in June of that year to clear his name of charges made by the Six Nations missionary Abraham Nelles. Returning to Canada, he married Ellen Hill or Karakwineh (meaning “moving sun”), and enrolled in the Toronto School of Medicine in 1863. He graduated with his B.M. in 1865 and his M.D. in 1866. In 1866, he also served in the Queen's Own Rifles during the Battle of Ridgeway, one of the armed conflicts of the Fenian Raids that year. After graduation, he practiced at Frankford, Stratford, Napanee, Buffalo, NY, and London, Ontario. As his medical practice grew, he also became a figure of increasing importance in Victorian Canada. In 1871, he became a member of Canada's National Rifle Team which competed at Wimbledon, and in 1874, was elected the President of the Grand Council of Indian Chiefs, a provincial organization largely made up of Anishinabe and Iroquoian communities in southwestern Ontario. In 1878, while living in London, he applied to become a member of the Independent Order of Foresters, a fraternal and financial institution. The Foresters' statutes explicitly limited its membership to white men and Orangemen, but Oronhyatekha was an Orangeman. By 1881 he had become Supreme Chief Ranger of Foresters, the organisation's international CEO, a position that he held for a record 26 years. In 1889, he moved to Toronto, where the IOF headquarters had relocated. 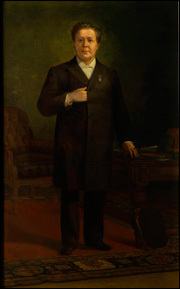 During his tenure as SCR, he transformed the order into one of the wealthiest fraternal financial institutions in the Victorian world; today, it counts more than one-million members in North America and the European Union. Oronhyatekha was an active Orangeman and served as County Grand Master of Middlesex Country Orange Lodge. While heading the Foresters, he built one of the first North American museums created by a Native individual. It was housed in the Foresters' Temple which once stood at the corner of Bay and Richmond in Toronto, until shortly after his death, and contained natural history artifacts, items from Canadian Native groups, and from cultures around the world. The artifacts were transferred to the Royal Ontario Museum in 1911. For its time, the Temple was the tallest office building in the British empire and incorporated the latest technology such as electric elevators and lights, both of which were powered by an electrical plant in the basement, a chilled drinking water system, and extensive fireproofing. The Temple also featured many amenities for its staff, including its own newsstand, cafe and dining room, smoking room, meeting rooms, and bicycle storage. He belonged to the International Order of Good Templars, several branches of the Masonic Order, the Ancient Order of United Workmen, the Knights of the Maccabees, and the Orange Order. He was the Worshipful Master of Richardson Masonic Lodge in Stouffville, Ontario in 1894. In the 1890s, he purchased an island across from Deseronto which he renamed Foresters' Island. Here, he built a second family home, an IOF meeting and dining hall, a bandstand, the Isle Hotel and cottages for guests, and a wharf at which boats from the mainland could dock. While the hotel seems to have been open for all guests, not just IOF members, he hosted huge IOF gatherings each summer to celebrate its anniversaries. Colour postcard of "Orphans' Home, Foresters Island near Deseronto, Ont. ", published by Valentine & Sons Co. Ltd.
Ironically, the one achievement of which Oronhyatekha was most proud was the enterprise his contemporaries regarded as his only significant failure. In 1904, he created an orphanage on the Bay of Quinte, Ontario, It opened for operations in 1906, and Oronhyatekha described it as his life's crowning achievement. He did not live to see it be sold in 1908 due to his death after stopping off to visit President Theodore Roosevelt in Savannah, Georgia a year earlier. He and Ellen had six children, only two of whom survived to adulthood. Three of his children died very early. One son, Henry, drowned at the age of 10 during the sinking of the Victoria on the Thames River in London, Ontario, on Victoria Day of 1881. His eldest child, Catherine, married Percy John Johnson, an Australian, and his son Acland, also a medical doctor married twice. Neither had any children. Acland died a few months after his father. Oronhyatekha has been commemorated with several designations, including a plaque erected by the Toronto Historical Board in Allan Gardens in Cabbagetown where he lived in Toronto. His house at 209 Carlton is listed in the Cabbagetown heritage inventory and is part of the Cabbagetown Heritage District. A nearby lane has been named Dr. O Lane. His former home in London, Ontario, at 172 Central (formerly Litchfield) Avenue, is currently under consideration for local designation. The Temple building which would have easily qualified for historic status, was demolished in the 1970s, but his sculpture by Walter Seymour Allward moved to the IOF new headquarters at 789 Don Mills Road. Parks Canada designated him as a national historic person in 2001, erecting a plaque at Tyendinaga. In 2002, the Royal Ontario Museum and the Woodland Cultural Centre curated an exhibit called Mohawk Ideals, Victorian Values which featured his museum collection, once displayed at the IOF Temple building. His biography has been co-authored by Keith Jamieson and Michelle Hamilton for Dundurn Press. An accumulation of photos has been started on Facebook. ^ "Biography – JONES, PETER EDMUND – Volume XIII (1901-1910) – Dictionary of Canadian Biography". ^ Sherwin, Allan (2012). Bridging Two Peoples Chief Peter E. Jones, 1843–1909. Waterloo: WLU Press. ^ Wilson, J. G.; Fiske, J., eds. (1900). "Oronhyatekha" . Appletons' Cyclopædia of American Biography. New York: D. Appleton. ^ Radforth, Ian (2004). Royal Spectacle:The 1860 Visit of the Prince of Wales to Canada and the United States. Toronto: University of Toronto Press. ^ Independent Order of Foresters. Oronhyatekha Historical Rooms and Library; Oronhyatekha Historical Collection; Cumberland, Barlow. "Catalogue and notes of the Oronhyatekha Historical Collection". [n.p.] Supreme Court, Independent Order of Foresters – via Internet Archive. ^ Michelle A Hamilton, Collections and Objections: Aboriginal Material Culture in Southern Ontario. Montreal: McGill-Queen's University Press, 2010; Trudy Nicks, "Dr. Oronhyatekha's History Lessons: Reading Museum Collections as Texts," Reading Beyond Words. Contexts for Native History. Ed. Jennifer S.H. Brown and Elizabeth Vibert. Peterborough: Broadview Press, 2003, 459-489. ^ Plummer, Kevin (30 August 2008). "Toronto's First Skyscraper". Torontoist. ^ "Mohawk Ideals, Victorian Values: Oronhyatekha M.D." Comeau-Vasilopoulos, Gayle M. (1994). "Oronhyatekha". In Cook, Ramsay; Hamelin, Jean (eds.). Dictionary of Canadian Biography. XIII (1901–1910) (online ed.). University of Toronto Press. Dr. Oronhyatekha: Security, Justice, and Equality Jamieson, Keith and Michelle A. Hamilton. Dundurn Press, 2014 on Amazon.com. This page was last edited on 19 March 2019, at 11:14 (UTC).